WALTHAM, MA--(Marketwired - September 30, 2015) - Elsevier, a world-leading provider of scientific, technical and medical information products and services, today announced the publication of the globally oriented new title, Encyclopedia of Food and Health. The five-volume encyclopedia provides readers with comprehensive coverage of a wide range of topics, from food production and processing to health effects. 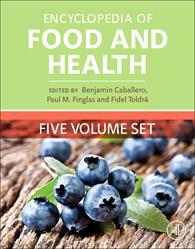 Elsevier also announced that four additional food and health books have published. Covering all areas of food science and health in more than 550 succinct and straightforward articles, Encyclopedia of Food and Health provides a completely cross-referenced, one-stop resource for researchers, students and teaching faculty. It is available both in print and in the easily searchable online format when accessed on ScienceDirect. The Encyclopedia will also be part of Elsevier's forthcoming Reference Module in Food Science available later this year. Encyclopedia of Food and Health identifies essential nutrients and how to avoid their deficiencies. It explores the use of diet to reduce disease risk and optimize health, and compiles methods for detection and quantitation of food constituents, food additives and nutrients, and contaminants. This resource will be valuable to food scientists and technologists, nutritionists, dieticians, food manufacturers, public health researchers and government agencies. Benjamin Caballero, PhD, MD, Paul Finglas and Fidel Toldrá, PhD are the Editors-in-Chief of Encyclopedia of Food and Health. Dr. Caballero is Professor of International Health and Pediatrics, and director of the Center for Human Nutrition at the Johns Hopkins Bloomberg School of Public Health. He is a member of the Food and Nutrition Board of the Institute of Medicine, National Academy of Sciences, of the Standing Committee for Dietary Reference Intakes, and of the Nutrition and Metabolism Study Section of the National Institutes of Health. Mr. Finglas is head of the Food Databanks National Capability and Research Leader in Food and Health at Institute of Food Research in the UK. He is also executive editor of Trends in Food Science & Technology and editor of Food Chemistry, both published by Elsevier. Dr. Toldrá is Research Professor at the Instituto de Agroquímica y Tecnolog a de Alimentos (CSIC) and recently became Editor-in-Chief of the Elsevier book series Advances in Food and Nutrition Research. He has filed 11 patents, authored one book, edited/co-edited more than 30 books, and published more than 210 manuscripts (SCI) and 90 chapters of books. In order to meet the growing need for content in food science and health, Elsevier uses proprietary tools to identify the gaps in coverage of the topics. Editorial teams strategically fill those gaps with content written by key influencers in the field, giving students, faculty and researchers what they need to answer challenging questions and improve outcomes. These new books, which will educate the next generation of food scientists and nutritionists and provide critical foundational content for information professionals, are key examples of how Elsevier is enabling science to drive innovation. Covering all areas of food science and health in more than 550 succinct and straightforward articles, Encyclopedia of Food and Health provides a completely cross-referenced, one-stop resource for researchers, students and teaching faculty. The five-volume encyclopedia provides readers with comprehensive coverage of a wide range of topics, from food production and processing to health effects. From Food Safety and Quality Systems in Developing Countries, Volume One: Export Challenges and Implementation Strategies by André Gordon -- Fig. 1.1. Increasing share of US domestic consumption taken by imported fruits. 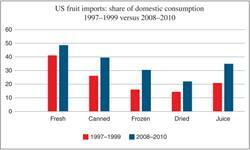 (Source: USDA Economic Research Service.) The expansion in consumer choice because of the experiential and demographic factors mentioned above has contributed to overall higher demand for fruits and vegetables. From Specialty Oils and Fats in Food and Nutrition: Properties, Processing and Applications by Geoff Talbot -- There are primarily four ways that oils and fats impact food systems, those being heat exchange, sensory, product structure, and nutrition. These four functions can be further subdivided as illustrated in Figure 7.1.